Yesterday was the feast of St. Hilda of Whitby and tomorrow is the feast of Christ the King. I find myself musing on Christian leadership and the predicament our world is in. It’s often hard to see where the effective leaders are – locally or nationally or internationally. There seems to be little regard for real community much less for the Reign of God. But St. Hilda offers us a vision of Christian leadership and Christian community that can give us hope for our church and our world. Hilda was a strong leader who understood her role in helping her monastic community of the seventh century to be a sign, an icon, of the Reign of God in the midst of a world like ours that was either fighting over God or denying God. She was an effective diplomat who governed a double monastery of men and women and was highly respected by both. She had an influence in the wider church as well – she hosted the famous Synod of Whitby in 664 that tried to find a compromise between Roman and Celtic church traditions. She was a compassionate and discerning woman who cared for the whole household of God in the monastery – not just the sisters and brothers, but the servants too – what we would call today employees. One of the most famous stories about her has to do with Caedmon, a servant who cared for the monastery’s animals. He did not think he was capable or worthy to sing about God in the way the troubadours did, but one night he had a dream that he was singing a beautiful hymn of praise to God. Hilda encouraged him to learn to sing, to play the lute, and to compose poems of praise. Her care for that one person who had a previously unrecognised gift shows her discernment and her gift of encouragement for her community as a whole. 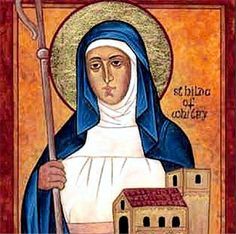 Hilda was baptised into the Roman church which had given birth to the Rule of Benedict, but after she met Aidan of Lindesfarne, and answered his call to come to Northumbria to establish a monastery there, she was also nurtured in the tradition of Celtic monasticism. And so she brought to her leadership the moderation and regularity of life of Benedict, as well as that interesting combination of asceticism and passionate love of nature that is so characteristic of the Celtic monastics. Hilda had found the pearl of great price, and that pearl was the truth of the Reign of God. It’s a message we need to hear today. Those of us living in intentional Christian communities in the midst of our secular society are also called to share the peace of Christ, to model what the Reign of God can be just by being willing to live together working for harmony in a world that has no harmony.